Goodbye great Britain, hello little England. 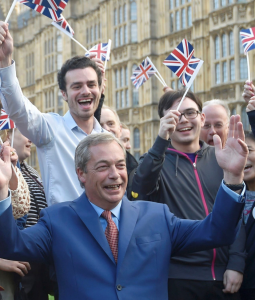 Nigel Farage and his racist band of little Englanders, combed hair in cheap suits, danced a delirious jig early on Friday after the Leave side shocked the world to win its so-called Brexit [British exit] from the European Union. The typical xenophobic euphemisms, about getting ‘back’ to ‘great’ Britain, claiming ‘our country back’, quickly followed the unexpected triumph, as did calls for much tighter border controls – which translates as: no more Johnny Foreigners please! It may have been a vote to quit a common economic market but the issue of immigration was central to the Leave side, which ran a divisive and nationalistic campaign throughout. MP Jo Cox was assassinated by a right-wing fascist days before the poll while pockets of blatant racism have been manifest since. In Newcastle [a city that voted narrowly to remain] on Saturday a number of shady looking men held a city centre banner calling for a ban on all “immigrants”. Racist graffiti at a Polish cultural centre in London on Sunday morning declared: “No More Polish Vermin” while London-based Polish consultant Max Fras was told to “F**k off” home “This is England now” at a Tesco supermarket. To read more BarrTalk, click here.